OGDEN, Utah (BRAIN) — Enve is now shipping its first all-carbon mountain bike stem, designed for trail, enduro and all-mountain use. ANTWERP, Belgium (BRAIN) — Lazer Sport has released a special edition of its O2 road helmet to raise money for the foundation named after late racer Amy Dombroski. BOULDER, Colo. (BRAIN) — Polar Bottle will become an official water bottle licensee of Team USA in an agreement with the U.S. Olympic Committee announced this week. BLOOMINGTON, Minn. (BRAIN) — 45NRTH is expanding their fat tire offering with the release of two wide and aggressive tires, the Flowbeist and the Dunderbeist. HOLSTEBRO, Denmark (BRAIN) — The Danish brand CeramicSpeed is offering a limited edition hollow titanium derailleur pulley set, produced by 3D printing. SEATTLE — Nuun has released its co-branded four-pack of electrolyte sports drink tablets in collaboration with PeopleForBikes, with proceeds to be donated to the advocacy organization. WESTLAKE VILLAGE, Calif. (BRAIN) — The Vapur Shades is a light and flexible “Anti-Bottle” that is designed to stand when full and can be rolled, folded or flattened when empty. MISSOULA, Mont. 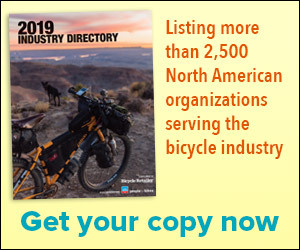 (BRAIN) — Adventure Cycling Association has released its Bicycle Route 66 map set, charting the course for cyclists to travel the famous corridor from Chicago to Los Angeles on roads appropriate for cycling, including sections of the historic highway. The 2,486-mile route is covered in a specially designed six-map set, allowing cyclists to tour the whole thing or ride a few sections. MINNEAPOLIS (BRAIN) — Sound Probiotics is a new brand founded by two endurance multi-sport athletes, whose first product is a probiotic designed to help endurance athletes stay healthy during heavy training and competition. MINNEAPOLIS (BRAIN) — The GoatLink replaces the Direct Mount intermediate link on Shimano 10-speed rear derailleurs to improve performance and drivetrain life with wide-range 1x10 drivetrains. SANDY, Utah (BRAIN) — Reynolds Cycling is offering a carbon-rim disc brake wheel for gravel-riding and cyclocross, the ATR (All Terrain Road) Disc Brake wheel. LOUISVILLE, Colo. (BRAIN) — For a limited time, a special laminated version of the 2015 Wheels Manufacturing derailleur hanger chart is available at no charge to IBDs in the U.S.
SAN DIEGO (BRAIN) — XEP, Inc. is introducing a skin patch designed to deliver a natural caffeine boost to athletes. VICENZA, Italy (BRAIN) — Selle Royal is introducing two new saddles this season that are padded with Slow Fit Foam, a memory foam with slow recovery properties that molds to the rider's body. SANTA CRUZ, Calif. (BRAIN) — Santa Cruz is launching a pair of new carbon bikes and framesets, the Stigmata cyclocross model and the Highball hardtail. BOULDER, Colo. (BRAIN) — Chain-lube brand Squirt has introduced a biodegradable cleaner designed specifically to work with its lube. Bio-Bike Wash is now available from J&B Importers and QBP. MILWAUKEE (BRAIN) — Fyxation, best known for its urban bikes, is getting into the fat-bike market with a new model called the Blackhawk. The company also is offering Blackhawk fat-bike framesets, wheels and hubsets separately. SAN LUIS OBISPO, Calif. (BRAIN) — Arts Cyclery, the exclusive U.S. importer of MarshGuard products, is now stocking the original MarshGuard fork fender in five new graphic colors. The new colors are Blue, Green, Purple, Orange, and Red. LOS ANGELES (BRAIN) — Produced as a true monocoque frame, with no hard joints or seams, the Ritte Ace is the Los Angeles bike brand's new flagship road racing model for 2015. BOULDER, Colo. (BRAIN) — Kappius Components is offering three digital pressure gauge models designed for folks looking for the ultimate pressure accuracy.